Wisdom of Life. : The Shanghainese women. Something i learned while moving around Shanghai. The Shanghainese girls have a different type of culture. They are not taught to cook and aren't be responsible to take care of the home. As little children, their mothers make sure all their daughters look beautiful and charming from the outside beauty. As girls they are trained to look for successful man who could provide financially and physically. Though Shanghai has a population of 17 million, many are actually migrated from other parts of China. 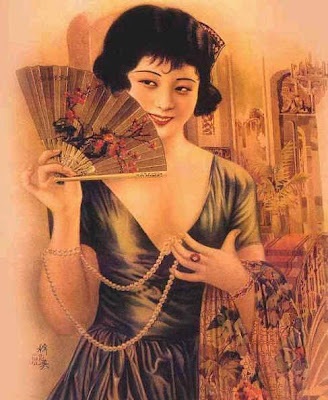 The typical Shanghai woman is the proudest female of all Chinese women because their men have to take care of them. Quote you one true story i saw. An oversea Chinese friend got marry to one local beauty here. At courting stage, the girl was so pleasant with her boyfriend. She was thrifty, helpful, understanding, kind and romantic. Not now anymore! The husband has to contribute 70% of his monthly income to the wife and her parents. After work he has to come home immediately to take care of the household chores. He has to wash and cook, almost like a house maid of the first class. He has to serve the wife's meals right up to her bed, just like room services in a hotel. I wonder whether he has to bathe her as well. Perhaps he was too shy to reveal to us. On all outings, the man has to carry her handbags and shopping bags too. According to the man who agreed before married to his wife, she has no intention to have baby. Looks like she only wants the man and no baby for him. With all these restrictions and demands, i thought the lady must be a very beautiful woman for the man to fall in love with. I dropped my eyes when i saw her! No she is not at all. I am puzzled and curious what have attracted the handsome and capable man to marry this woman. Is love blind or is The Shanghainese girl has special charm that all successful men could not resist. We have to guess!!! I am 66, WM, with a 45 yr. old shanghainese g.f. - tall, light-skinned, beautiful, polished, educated, can't cook when i met her 7 yrs ago but amazingly is learning, same with housekeeping. Thankfully she is financially independent, but otherwise Mr. Foo is a very observant man. I am lucky that she came to the U.S.A. at 18 yrs. and has "Americanized" enough to be the most amazing, desireable and compatible (though difficult) woman I have ever met. You are so lucky to have an imported Shanghainese. Love her with your whole heart and magic will appear. Thank you for reading my blog. Malaysian men are too idiots to have fell in love with Shanghainese women.. Have known many who have fell for their devious charms..